There’s nothing like Nebraska sweet corn. We bought an old four row planter just for planting our favorite summer delicacy. In February we special order from a company in Illinois extra sweet corn with names like “Sugar and Gold” and “Dynamite Duo” because we like the kind with both white and yellow kernels. The sweet corn patch is situated along the quarter mile long lane from the road to our house so it’s handy to pick a dozen ears for dinner. We don’t just plant four rows of corn but eight rows with half that will be ripe about the end of July and the other half that will be ready mid-August so that we can eat fresh sweet corn for thirty days straight. What do we do all this sweet corn? Some of it the raccoons get. Some of the corn we’ll freeze. The kids help pick about 200 ears which we’ll clean out in the machine shed to keep some of the mess out of the house. It’s then cut off the ears, cooked on top of the stove and frozen. The rest we give away-enough so that a few other families can fill their freezers with corn, too. Gotta love corn season. Golden nougats and white pearls gleaming with melted butter. With a grilled rib eye steak, it’s the perfect summer feast. 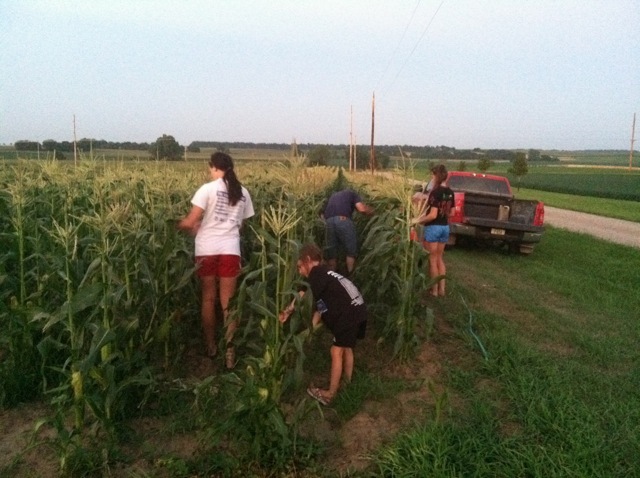 My family picking sweet corn at our farm near Madison, Neb. The first time I heard a negative comment about genetically modified (GM) seed I was in another country. The comment was made that the GM seed brought into their country had caused the bee population to decrease. There was no other explanation as that was the only apparent cause since GM seed was new to the region. We have been planting GM corn and soybean seed for the past few years. This is what I am noticing around our farm. Besides having better yields with less pesticide and herbicide usage we are seeing a proliferation of wildlife. 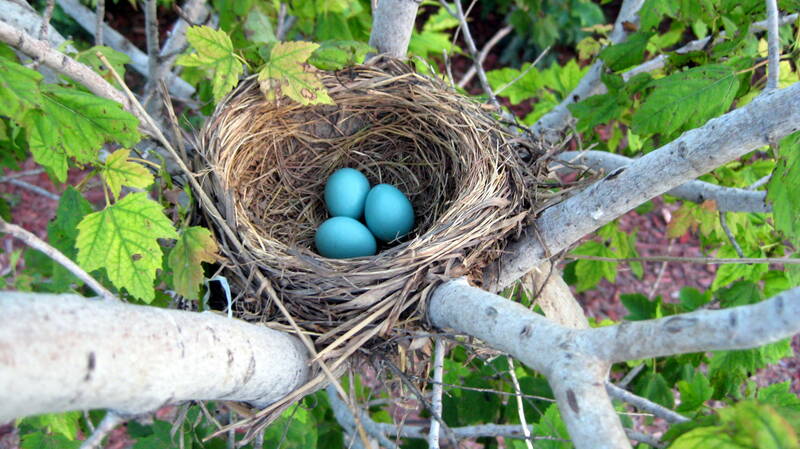 I recently took pictures of a bird and her eggs in a tree near our house because it was our daughter, Emily, who planted the tree when she was 14 and Emily is in Peru serving as a missionary right now. 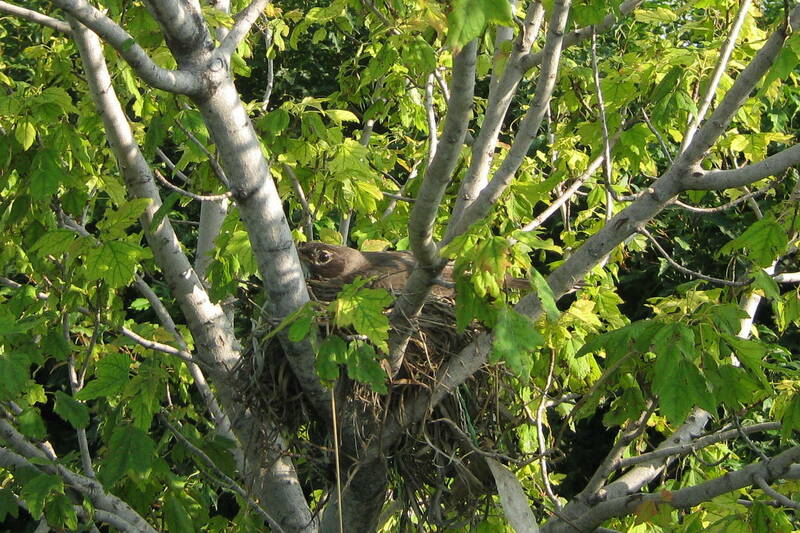 This is only one of countless bird nests I have seen when I walk our dog. This spring and summer I have noticed not only more birds but more butterflies, bees, frogs, rabbits, etc… What should I attribute this to? Could it be that the GM seed has caused a proliferation of wildlife? Last week, CommonGround Nebraska volunteers, Diane Becker, Joan Ruskamp, Linda Schwarz, and myself attended the CommonGround Shared Voices Conference in St. Louis, MO along with volunteers from 10 other states! 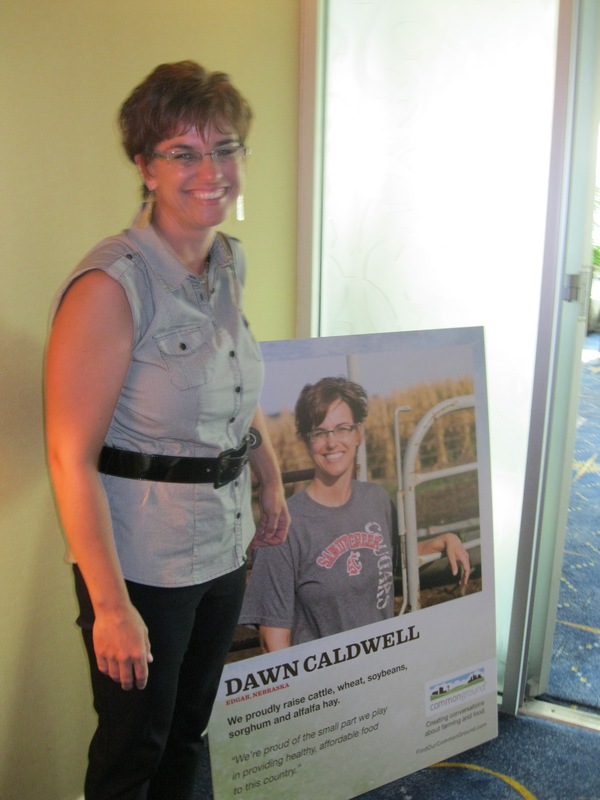 The focus of the conference was about creating conversations about farming and food. The first day was all about sharing our own farm & food story and gaining insight from other volunteers about how they share with others. One by one, each woman told their story – with tears and laughter – how life has brought them through agriculture and why they feel it’s important to grow safe, nutritious and wholesome food that they feed to their family and mine. We also heard from a representative from the U.S. Farmers and Rancher Alliance – an alliance that has brought agriculture together to all share the positive story of agriculture. They shared some important information on the right way to talk to and reach consumers and the positive messages that resonate with them. The second day continued in our conversation about farming and food – but we were lucky enough to hear from Kevin Murphy of Food Chain Communications and his discussion on the Food Morality Movement concerning religion, ethics and morality when it comes to animal agriculture. His encouragement was really that, “food is bigger than just food; it’s a social issue, a political platform and an academic forum”. This conference was a great way to get the CommonGround volunteers from all of the states excited about speaking up for agriculture and sharing what is passionate to them – food and farming! Did you know that CommonGround Nebraska has a YouTube channel? 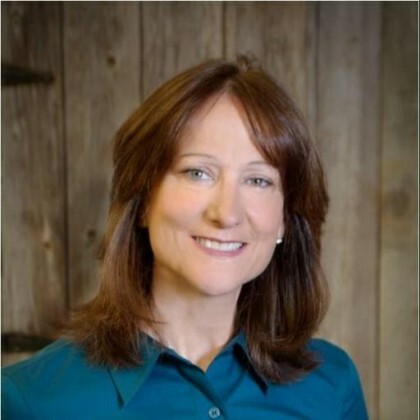 I was interviewed this month by Lincoln’s KOLN 1011 News to discuss the importance of farming and how the CommonGround movement is bridging the gap between farmers and consumers. You can watch the video here or go to our YouTube channel. Getting a phone call from the DEQ or the EPA saying they are coming in a couple of hours to check your records would be similar to the average American receiving a call from the IRS saying the same thing. For some reason there can be that flash of fear that makes us wonder if there was something we missed or if everything is up to date. There has been a perception of those government agencies that they are out to get us versus help us. Even though the agencies are run by people like you and I, we still picture this big monster in the sky called the government that seems to grow larger by the day. Recently I was volunteering for CommonGround Nebraska at a festival in Omaha. It was quickly apparent that many people had read and were concerned about GMO seed, large farms and large companies. I thought I would do more research using Google to see what everyone else was looking at for their information about GMO’s. Wow! There are numerous sites to choose from. Several sites try to give both sides but leave you wondering why you would want to take a chance on eating GMO foods. What I also discovered was that the first GMO product was insulin. One website that gave me basic information about GMO’s is http://www.bt.ucsd.edu/gmo.html . Addressing concerns about large farms and large companies goes beyond a Google search. I can only hope our efforts to blog, meet consumers and put our farms out on the worldwide web will give people a more accurate picture of agriculture in the United States. The evolution of new ideas to be better stewards using fewer resources and feeding more people is a gift we need to appreciate with appropriate caution, not fear. Hi! 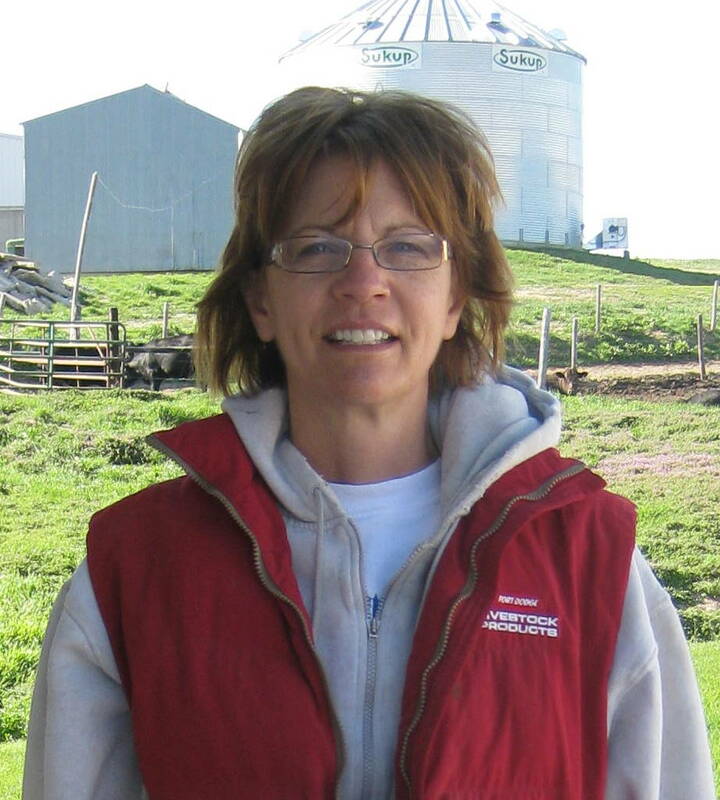 My name is Paula Peterson and my husband and I farm outside of Waverly, Nebraska. We started wheat harvest last weekend and I wanted to share some photos. 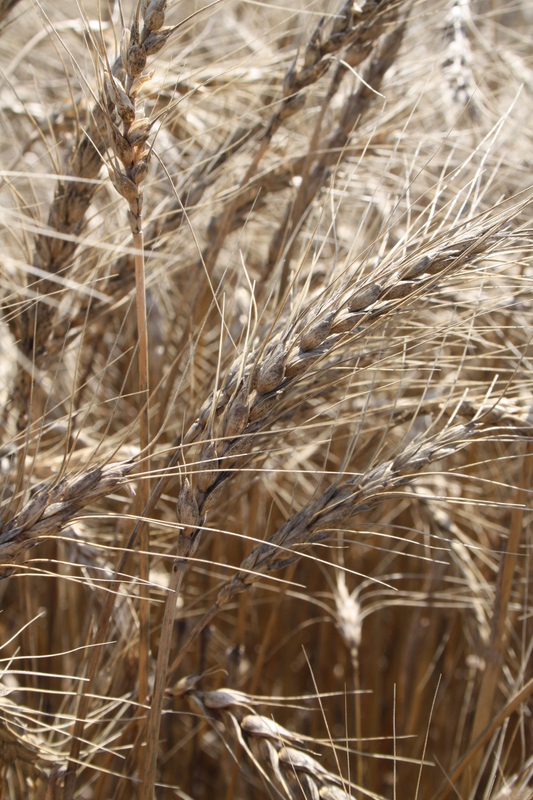 Here is a close-up photo of our wheat. We raise 160 acres of wheat, and about one acre is similar in size to a football field. This photo is our combine at work to harvest the wheat. Wheat is an important crop in Nebraska, with farmers producing more than 74 million bushels each year. Here we are unloading the wheat from the combine to a grain truck. This wheat will then be taken to a storage silo, or a grain elevator. Did you know that, according to wheatfoods.org , more foods are made with wheat than any other cereal grain?! Nutrition is a new, ever-changing science. Continual research increases our knowledge about what nutrients in what amounts are needed to maintain the human body and help keep it disease-free. The U.S. Departments of Agriculture and Health and Human Services have created the “Dietary Guidelines for Americans.” The new guidelines continue to emphasize balance, moderation and variety in food choices, with special emphasis on whole-grain products, low fat dairy, vegetables and fruits. For grains like wheat, they recommend to make half of your grains whole. Eat at least 3 ounces of whole-grain cereals, bread, crackers, rice, or pasta every day. One ounce is about 1 slice of bread, 1 cup of dry breakfast cereal, or ½ cup of cooked rice, pasta or cereal. And a lot that that whole grain is grown here in Nebraska! A barn swallow had decided to check out the inside of the concessions area where my friend had been sweeping. She, usually a calm sensible woman, took on the persona of a ninny. Usually she calms me down when I get upset about school issues or soccer scores. When I back down in a disagreement, she reminds me to stick it out. So here my friend was the one cowering outside of the concession stand under a Pepsi sign while I was yelling and swinging a rake at a bird. The bird finally swooped out and I swaggered out knowing the tables had turned and I for once had saved my friend. Then we spotted the nest above the restroom door. I took my rake to knock it down when she yelled at me to stop. She had just been acting as if a bird was going to eat her alive and now she wouldn’t let me get rid of the nest. I was confused. “What if there’s baby birds in there?” she said in a small voice. I was still confused. On the farm, barn swallows are all right if they stay in the barn. If they are in our machine sheds they will make a horrible mess on our expensive equipment, work tables and tools. We have to rid our sheds of barn swallows just like we rid them of mice. Just because I live on a farm means I’m a tough thug? No, but understand we can’t put up with rats in our hay bales just as some one in town wouldn’t dream of co-existing with rodents in their house or garage. Later on I had to rescue my friend from a toad hiding in the toilet plunger container. All in the day of a super hero.